I planted my garden from the far side toward the house without a plan. I figured the point was to get the seeds in the ground, so they’d grow. When Karl bakes bread without measuring anything, he calls himself a free-baker. I guess I’m a free-gardener. Now, it’s time to harvest the garlic, new potatoes and some of the onions. It looks tired on the far side of the garden, but in the earth is a bounty I’ve never harvested from my own garden. Last weekend, I dug up about five pounds of new potatoes to take to my grandma’s 84th birthday party, where I cooked the family meal for the first time. Today, I will dig up enough new potatoes to bake scalloped potatoes for one of my former student’s 9th birthday party. And, tomorrow, I will dig up some more. My free gardening worked out well since the tired looking side of the garden is hidden from the tiny house deck by tall Kennebec potatoes and tomato plants trellising on locust posts. It looks lush and happy. I’m proud of myself for going for it even if I didn’t know exactly what should go where. Even if it could be better, it is perfect. Last night, I wound some wire around two more locust poles that Karl harvested from the forest when he made way for our bigger tiny house. (Locust will last a long time when used for poles; it’s a natural “pressure treated” wood. Lots of folks use it for fence posts and trellising. One of our friends even built his house on locust poles.) I wrapped the cucumber vines around the wire and will continue to train them to trellis the wire. Soon, I will make pickles. 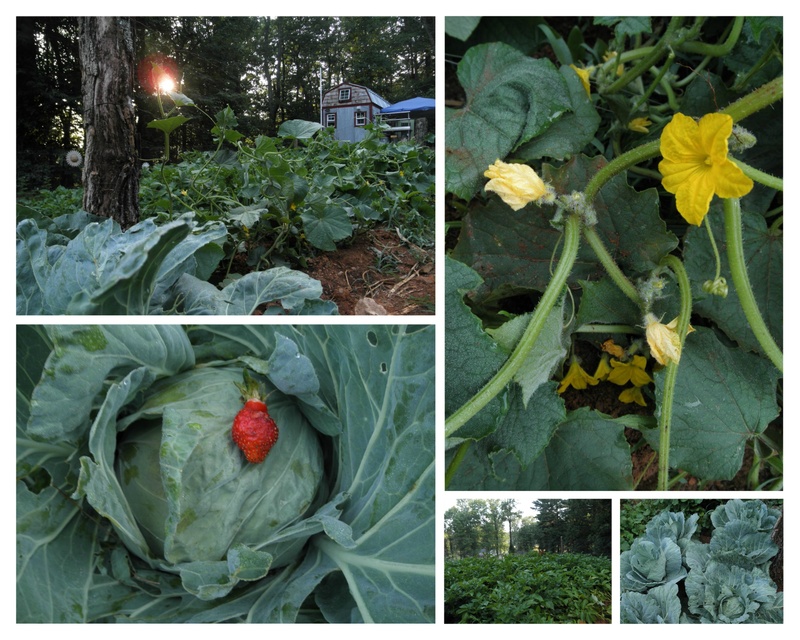 Even though the cabbage worms were racing me to the finish line, I am happy to report that we have six nice heads of cabbage, ready to harvest. I can’t wait to harvest and taste Karl’s Asian slaw made with my homegrown cabbage. Today, I am going to dig a bead for basil. I love pesto, and will plant almost the rest of the garden with basil. Basil is the first thing I ever grew successfully, and pesto is easy to make and preserve for the winter. It’s a delight to pull a jar out of the freezer (wait, we don’t have a freezer) in the middle of January for pesto pasta. So, I have a confession. I want a freezer. I’ve been thinking about it for a long time. It’d be so nice to freeze some of this bounty, rather that having to can all of it. I don’t know if we’ll actually buy one, I guess that depends on craigslist, but it is something I think about. Not a big freezer, just a tiny one. What’s happening in your garden? What’s your favorite thing to grow? Share in the comment section. Happy summer! Re the freezer–I think an under-the-counter freezer, like those used in restaurants, would be perfect for you. They usually have 3 drawers. There are also refrigerators designed like a chest-of-drawers. They are on wheels, & have heavy-duty plastic removeable liners. I know way too much about restaurants 🙂 Good Luck! 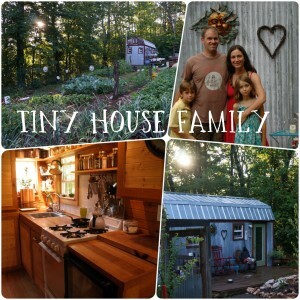 Great tiny house idea, Kim! We couldn’t do that in this house without totally changing the kitchen design, but maybe in our next one! Thanks for reading and commenting! Happy 4th of July! 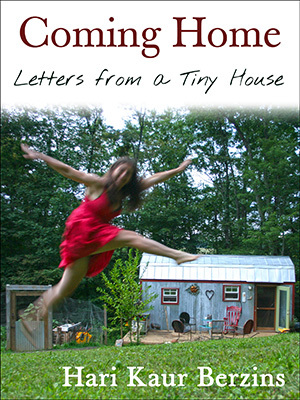 Always a spirit fueling experience to read from The Tiny House Family blogger, Mama. 🙂 Thanks for reading! love you. I think the way you’re going about this – without a plan – is a great idea for getting started and accumulating experience. Winter is a great time to review what worked, what didn’t, what you want to grow but haven’t yet, and to plan. It’s really exciting when you’re growing plants for food you really love (like the basil pesto). I trust you’re keeping a journal of everything you’re doing, so you can review later. You asked in the last post “how does my garden grow” (haven’t been back to this blog until today) – alas, I’m living in a tiny condo in the big city of Los Angeles, and have a few plants on the patio. Nonetheless, there are some amazing gardeners here, and a terrific growing season, and someday I will be growing food again (I grew some food back east, years ago). Thanks, Kirk! I am keeping a journal, and learning lots along the way. It is super fun. Glad you are using your patio to grow. I saw some neat ideas on apartment gardening a while back. I’ll have to see if I can find those links. Happy 4th of July! I hope I meet you someday 🙂 I was out picking eggplants and squash. Tomorrow I will go berry picking with my mother – something I could not do when I had my ‘big’ house…..spend four whole hours to get two gallons of berries, yes, this would have been considered insanity just two years ago 🙂 Cheers, my friend! I just read a bunch of pickle recipes online and then created my own from what spices I had on hand. Most called for 1 to 1 ratio of vinegar and water but I think next time I will use much less vinegar and white vinegar, I used apple cider for one jar and red wine for another. A bit too pungent. Thanks, Anne Marie! Today is pickle day for me! I’ll do the same. Typing with dirt on my fingers, as I take a short break from digging a bed for round two. Happy day to you!